Is it Monday night? Are you tired from a long day at work, but don’t want to go home and watch Netflix alone? Why not visit our unique kava bar? Take advantage of our comfy sofas and flat-screen televisions all while enjoying a relaxing shell of kava. Are you a service industry professional? Visit us any night of the week and we’ll take 10% off your tab in appreciation for all you do. Are you a singer, poet or comedian? 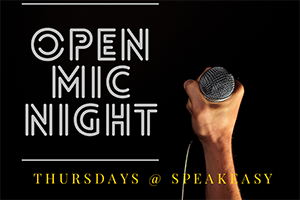 Visit us for our Thursday night open mic and make your talents known. Follow us on Facebook to stay up to date on the latest. 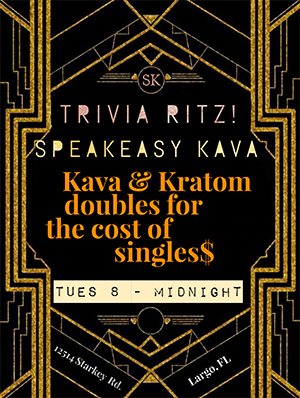 If you’re searching for a comfortable, alcohol-free venue with complimentary Wifi that’s open late to host gatherings for your favorite meet-up group; Speakeasy Kava is a great venue to consider. Reach out to us at speakeasykava@gmail.com to discuss options and to book your gatherings. Looking to do a kava bar crawl? Message us on Facebook to make arrangements for a special deal! Beginning at 8pm, stop in for a chance to win some drinks! Pay What You Roll Sundays! 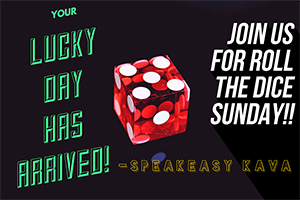 All day, come in & take a chance - pay your dice roll!